It would be a misleading omission to include a page about human evolution without acknowledging that many people do not accept as true the theory of evolution, of which human evolution is a part. Discussion of the truth and acceptability of the theory of evolution vs creationism (as described in the biblical accounts included in Genesis) and other explanations offered by various spiritual or religious traditions is beyond the scope of this page – and of most biology courses. The information that follows below is intended to be a useful summary of the material required by some UK A-Level courses and not as a contribution to or endorsement of any arguments in the evolution vs creationism debate. Human Evolution or sometimes more specifically human evolutionary biology is a minor topic in some first-level courses in biology, human biology and human anatomy & physiology e.g. A-Level (AS or A2) and equivalent introductory-level courses for entry into health science careers. This page is related to the hominid evolutionary tree, humans compared with gorillas and humans as primates. Why do some people believe that humans evolved from ape-like primates? The theory of human evolution, in common with the theory of evolution more generally, is based on archaeological evidence, especially information from fossils. Fossilized remains of many different lifeforms, including long extinct plants and animals, have been found all over the world. Some fossils are not unusual and do not add further information to that already accepted by scientists but they can be of interest to collectors, artists and other enthusiasts. Other fossils are useful to science because they can provide new insights into the types of plant or animals in a particular place at a particular (approximate) time in the past. This information relies on scientists being able to "date fossils", that is to estimate with reasonable accuracy when the plant or animal was alive. There are several ways to date fossils. It is possible to establish the relative age (that is relative to other adjacent types of rock) of rocks that contain fossils from the position of the type of fossil-bearing rock e.g. as seen in exposed rock faces. This approach may be used to make a "first approximation" of the age of fossils found within a specific type or layer of rock. Obviously there is a limit to the accuracy of dates suggested by stratigraphy and it is necessary to know where the fossil was found - in terms of both location on the earth's surface and depth (or height if from an exposed cliff face). Potassium-argon dating is generally considered to provide more accurate information than stratigraphy - but it also requires the use of expensive laboratory equipment and appropriately trained personnel. Potassium-argon dating is especially useful for determining as closely as possible the age of materials over 500,000 years old. Human evolution is sometimes described using a diagram called the Hominid Evolutionary Tree. A simple version is shown below. Click anywhere on it for for information - then scroll down the next page to read the table comparing species of 'early humans'. Expert opinion about these species, including both their physical characteristics and lifestyles, is based on archeological finds such as fossils of various remains e.g of part- and complete skulls and other bones. Scientific opinion changes over time as further arefacts are discovered and human understanding of both recent and long established finds develops. The signifcance of objects may be reinterpreted due to fresh ideas, perhaps from artefacts found elsewhere, and due to the use of new technologies to re-examine specimens. Human evolutionary biology is a large subject that encompassing aspects of biology, geography and ancient history. Even those who do not accept the theory of evolution as the truth about human origin might find fossils and other indications of past lives interesting. 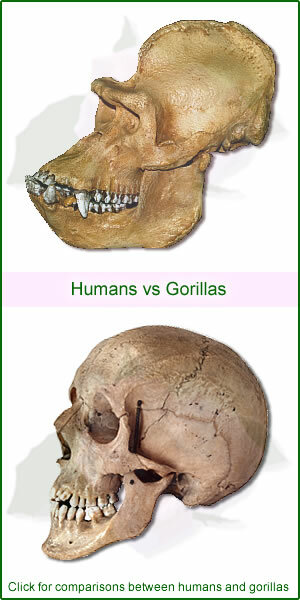 See also the hominid evolutionary tree, humans compared with gorillas and humans as primates.